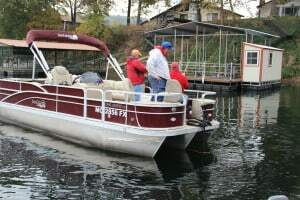 Branson Trout Guide a full time Pontoon Fishing Guide Service on Lake Taneycomo right in the Heart of Downtown Branson Missouri. Lets go Trout Fishing! Branson Trout Guide in Downtown Branson Missouri! Ask Branson Trout Fishing Guide about our 2 Hour guided trips on Lake Taneycomo. 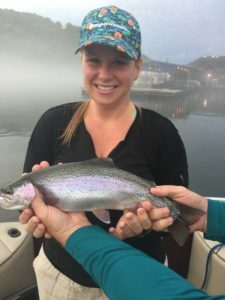 Branson Trout Guide welcomes you to Lake Taneycomo in Branson Missouri, ready for a relaxing beautiful day of trout catching on the tail waters of Table Rock Lake better known as Lake Taneycomo. Crystal clear and very cold water in the Mid 40’s makes a great home for Rainbow and Brown trout to live and thrive. Branson Trout Guide on Lake Taneycomo offers super year round trout catching for all types, styles and skill levels of our clients. 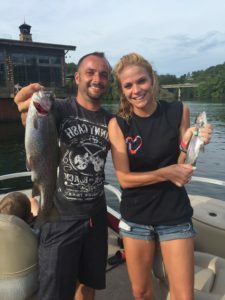 Branson Trout Guide in Branson Missouri offers a complete professional guided fishing trip for the whole family or just a quite get away for Dad, Large Groups and Families are welcome anytime to fish in comfort of the same boat only at Lake Taneycomo. 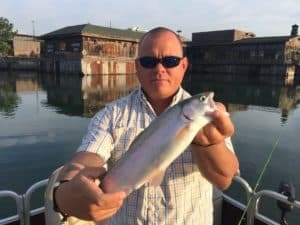 Branson Trout Guide on Lake Taneycomo is here to give you the best trout fishing that the Southern Missouri has to offer and will show you all of the tips and techniques for Lake Taneycomo for fast action Brown and Rainbow Trout within a short cast of Branson Missouri. Lake Taneycomo offers a first class trout fishing river and just produced the New Missouri State Record Brown Trout, 28 pounds 8 ounces. My trips will go after both Brown Trout to Rainbow Trout with live bait (Night crawlers or Power Bait) down the river toward Branson or up the river past fall creek in the trophy area using jerk baits for Big Brown Trout or the artificial fly’s drifting for the Rainbows, Lake Taneycomo offers the whole family a great chance to catch fish all year! Large Groups and Families Welcome all Year round!! Branson Trout Guide will have a boat for everyone 2019! Single person to Large families and Corporate Groups are welcome to fish in the comfort in both of Branson Fishing Guide Service boats. Families and larger groups up to 6 persons in our G3 Boats V322FC Fishing Pontoon for your fishing enjoyment! Four custom sit down fishing seats, full couch and table, most covered from the sun, plus a sun deck seat for those who like to just hang out! More than just a Pontoon Boat a total tricked out but comfortable fishing machine loaded with all of the state of the art electronics, fishing equipment and tackle needed for that fun day on the water for everyone. 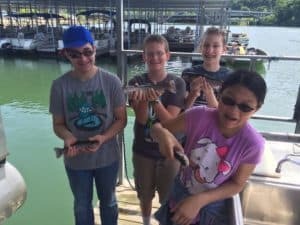 Branson Trout Guide can offer all types of fishing trips for the beginner family trips to all out professional’s getting ready for the tournament coming up. We offer detailed Deep Water Training Trips, Side Imaging Training Trips or just an relaxing day for you to get away from the busy streets of Branson Missouri and enjoy guided fishing trip Table Rock Lake or Lake Taneycomo in Branson Missouri. I started my business with a true love of fishing and a dream of fishing for a living, all kinds of fishing. I wanted the chance to fish for a living either tournament fishing (too much travel) or guiding, some way I was going to fish for living or as some say fish for food! Guiding was the way for me, I could stay at home on the lake and still fish everyday, so I started guiding on Table Rock and Lake Taneycomo for a living and man what a experience from fishing for trout to bass learning all of the tricks to catching all of these fish. I was able in incorporate over 15 years of tournament fishing the Bass Federation levels, local club level and a few other bigger tournament series around Missouri into my guiding skills and experience. I have spent the last 10 years full time perfecting all of my fishing skills and fishing techniques used to guide here on Lake Taneycomo and I can teach you the use of these techniques like, Float Rig’s, Drift Rig’s, Live and Artificial bait usage and detailed Electronics Instruction plus many more. Your trip can be a all out training instructional fishing trip, or just a family outing to have fun relaxing day on the water the choice is yours. Call Branson Trout Guide on Lake Taneycomo Branson Trout Guide and ask for Capt. Don (417-270-7157) and let’s book that trip of a lifetime today! Give Captain Don House a call for all of your fishing needs on Lake Taneycomo. Call for that last minute trip call Branson Trout Guide when your here in Branson Missouri and let’s go fishing. Lake Taneycomo Branson Trout Guide and also Table Rock Lake where everyone can have fun!